The Optimist is, quite simply, the dinghy in which the young people of the world learn to sail. It is a single sailor, 7’6″ by 3’8″ flat bottomed, hard-chine, pram-bowed dinghy. The boat weighs 77lbs and is easily car topped frequently with two on the roof. It is the only dinghy approved by the International Sailing Federation exclusively for sailors under 16 years of age. Optis are sailed in over 95 countries by over 150,000 people. 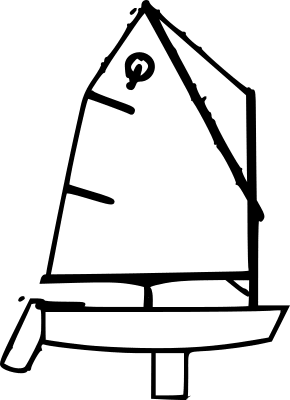 In the US, Optis are sailed across the country with concentrations in the Northeast, Mid-Atlantic States, Midwest, and Gulf Coast. Opti sailing has been growing at a tremendous rate throughout the country for the last few years.